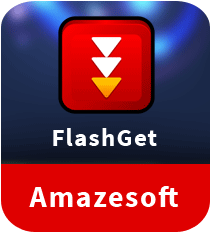 FlashGet is a popular downloading utility developed by Amazesoft. The free download manager features Multi-server Hyper-threading Transportation technique that provides a remarkable boost in downloading speeds. The download manager lets you simultaneously download multiple files and provides support for BT, eMule, FTP, HTTP, RTSP and several other Internet protocols. FlashGet download manager automatically switches between protocols, all for providing you with the best downloading speeds possible. FlashGet software for Windows features a BT optimization technique termed as the One Touch technique that automatically starts downloading files once it has collected all the required seeds info. All types of downloads are assigned a specific category such as video and programs, by default. In addition, you can define more download folders (and select file formats) as you desire. Download FlashGet now to get a fast and seamless downloading experience. FlashGet downloader automatically integrates with your antivirus program and calls the security utility as soon as it finishes a download. The file transfer tool relies on a very low level of system resources and doesn’t alter any significant performance issues over other programs running on the system. The free downloading tool features UDCT (Ultra Disk Cache Tech) that adds extra stability to all your downloading files. Furthermore, the download manager splits download files into a number of sections and then downloads them separately to gain a significant download boost. It also supports multi-point transfers in parallel. > Increased downloading speed – Features a number of unique technologies that boosts downloading speeds even for files present on web servers with limited download capabilities. > Inbuilt file manager – An inbuilt file manager lets you easily manage your downloaded files as well as other files available on your system. > No advertisements – The downloading utility doesn’t offer any kind of advertisements. It neither comes with bundled adware or any kind of additional software. > Concurrent downloads – FlashGet lets you download multiple downloads at once. These concurrent downloads may/may not be from the same website. FlashGet is a nice download utility that lets you download all your favorite files from the Internet. The tool is small in size and requires only a small amount of resources to operate. Furthermore, the downloading software is available as a freeware and hence can be used for personal as well as for professional purposes, without any limits. Very helpfull on slow internet connections.